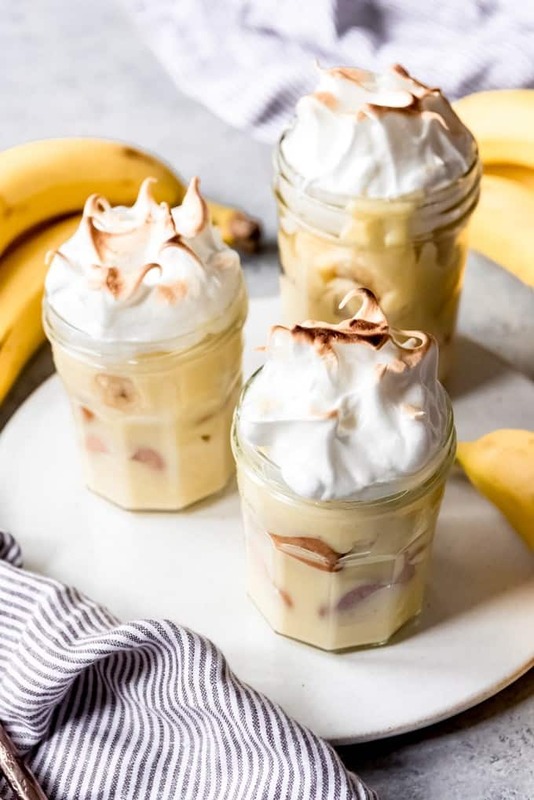 This Homemade Banana Pudding recipe is a classic Southern dessert made with layers of sliced fresh bananas, an easy homemade custard, Nilla wafers, and topped with a light and fluffy meringue! 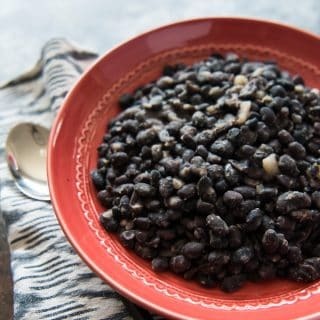 It’s the perfect way to finish any Southern meal! Here’s a truth: I don’t really like bananas. Unless they are in a creamy, dreamy dessert like this Southern banana pudding. Or baked into banana bread. Or sliced into banana cream pie. Okay, so I like bananas, just not plain bananas. We just got back from spending Spring Break with our kids in Georgia and South Carolina and ya’ll, the food there is seriously fabulous. At one point, we were checking into our hotel and the desk clerk smiled at my girls and asked “how ya’ll doin’ today?” in a thick Southern accent. They looked at her quizzically so she repeated herself. At which point they looked to me for help. I’ve been to over 20 countries but don’t know that I ever felt like I stuck out as a tourist quite as much as I did in that moment. 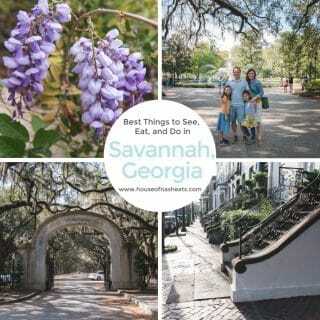 We ate our way through Atlanta, Charleston, and Savannah on our trip and loved all of the delicious foods. 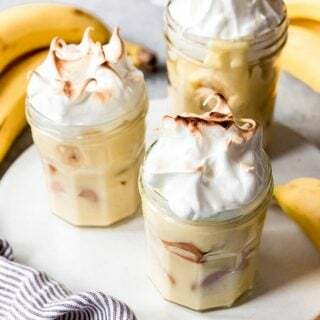 I’ve got a whole bunch of Southern goodness coming your way, but figured I ought to start out with one of our all-time favorite desserts: homemade banana pudding! And we are making it the true Southern way, with a billowy toasted meringue on top rather than whipped cream. Of course, if you want to top your banana pudding with whipped cream rather than meringue, I totally understand. We like it that way too and I’m not gonna judge if you choose whipped cream instead! 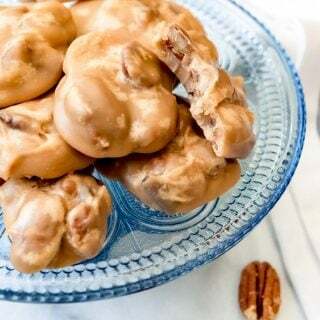 But for the sake of authenticity, a true Southerner is most likely to make these with a light and fluffy, towering meringue. I actually made multiple batches of banana cream pudding when I was recipe testing and I definitely preferred it with clouds of meringue on top. 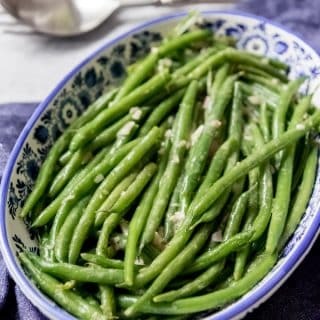 This is the first recipe I’m sharing celebrating foods from Georgia (the state, not the country) as part of my American Eats series. It’s really eaten all over the South, but I had to share it for Georgia since it was my favorite dessert at Paula Deen’s restaurant in Savannah. If you love southern food like I do, you might also want to check out the dishes I shared for Alabama as well. 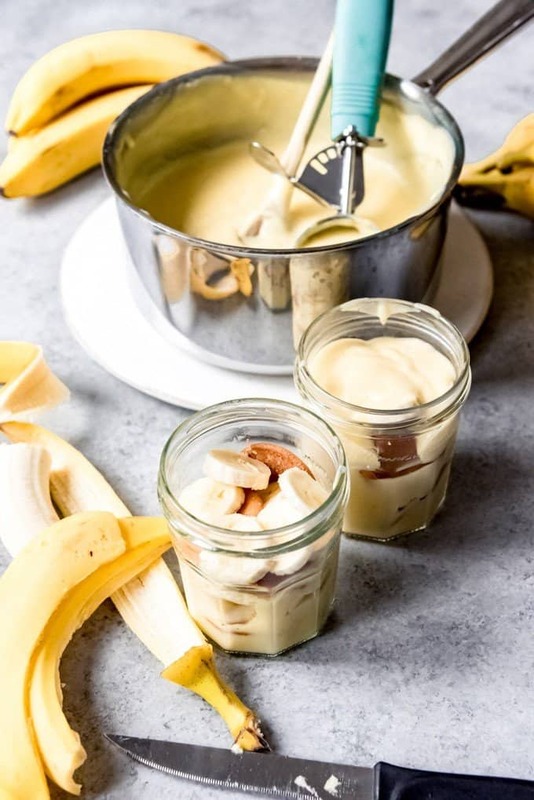 If you have never made banana pudding from scratch – or any pudding from scratch for that matter – it’s actually super duper easy to do. And the flavor and texture is leaps and bounds beyond that of boxed pudding mixes. Whisk together the flour, sugar, and salt. Whisk in the egg yolks and 1/2 cup of the milk. Save the whites for a meringue or add them to omelets or make macarons or something! Pour the remaining milk into a heavy saucepan and cook over medium heat, just until bubbles begin to form around the edges of the pan. Slowly pour 1 cup of the hot milk into the egg yolk mixture, whisking until combined to temper the egg yolks. Pour the tempered yolks into the pan with the remaining hot milk, whisking to combine. Continue to cook and stirring constantly over medium heat for about 10-12 minutes until the pudding has thickened. You may prefer to use a double boiler to prevent scorching, but I’ve never had a problem as long as I keep my heat at medium and stir constantly. Once the pudding has thickened, remove from the heat and stir in butter and vanilla. Layer Nilla wafers in the bottom of individual serving dishes like ramekins, mason jars, or glass cups. Or make one big banana pudding using a large bowl, pie plate, or 7 x 11-inch baking dish. Pretty much anything goes. 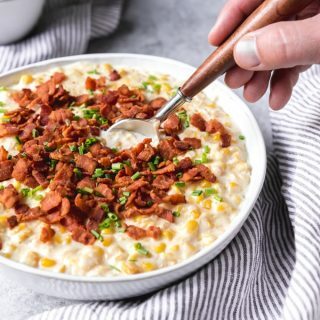 If you are feeding a crowd, you can double the recipe and use a trifle dish or a 9 x 13-inch pan. Slice half of the bananas over the Nilla wafers, then spoon half of the pudding over the bananas. Repeat the layers with the remaining Nilla wafers, bananas, and pudding. At this point, you could chill and top with sweetened whipped cream, if you decide to go that route. 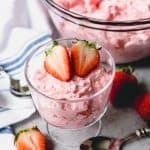 To make the meringue, beat the reserved egg whites and cream of tarter in the bowl of a stand mixer fitted with a whisk attachment until soft peaks begin to form. Slowly add the granulated sugar while beating and continue to beat until stiff peaks form, about 3-5 minutes. Spread the meringue on top of the banana pudding, using the back of a spatula to push the meringue to the edges of the pan or container and create peaks and swirls in the meringue. Finish by baking the banana pudding for 10-12 minutes at 350 degrees F until lightly browned on top. 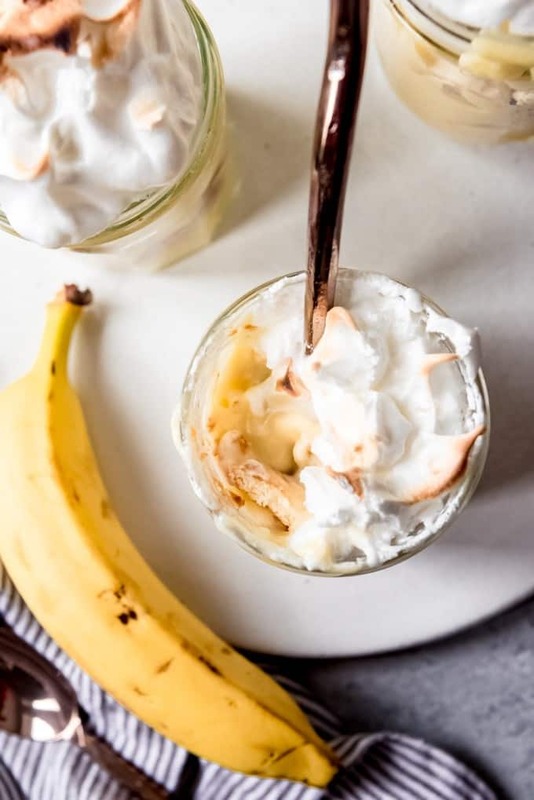 Or, for individual banana pudding servings in mason jars or ramekins, I will broil them just until the top of the meringue is toasted or even use a kitchen torch on them. Garnish with Nilla wafers, if desired. As you can see, the actual pudding part of this dessert isn’t actually banana flavored. 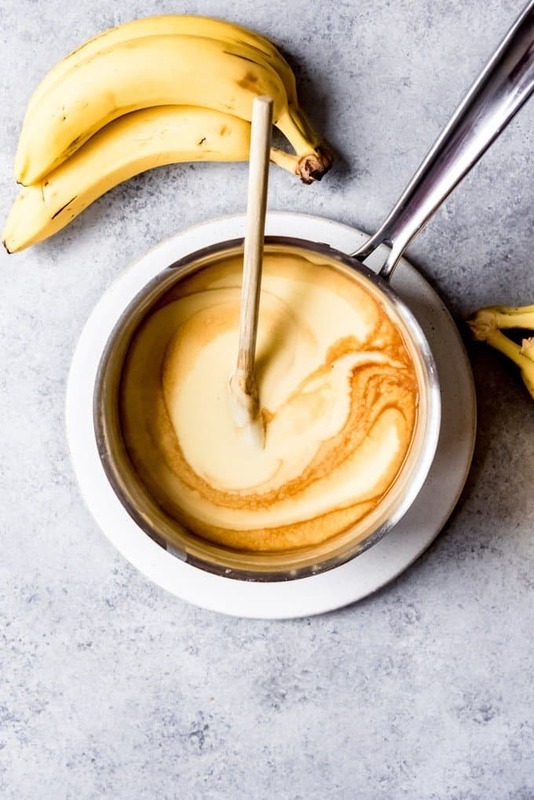 It’s really just a vanilla pudding with bananas in it. Just like banana cream pie is a pie shell filled with vanilla custard and sliced bananas. 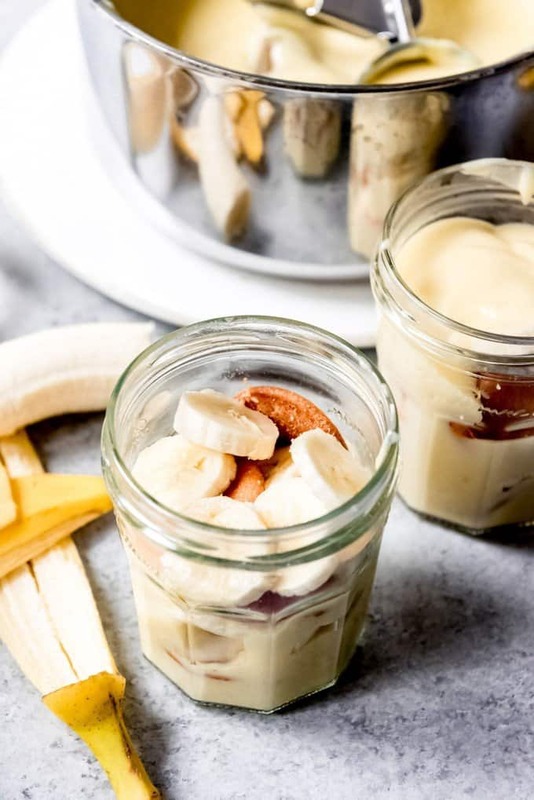 I have seen other recipes that call for banana extract or mashed bananas to be added to the pudding to flavor it, but I prefer this old-fashioned banana pudding recipe with a vanilla custard instead. Do you eat banana pudding hot or cold? I have strong feelings about this. We definitely prefer to eat our southern banana pudding while it is still warm. I’ve been told that this is also how most southerners prefer to eat it as well. 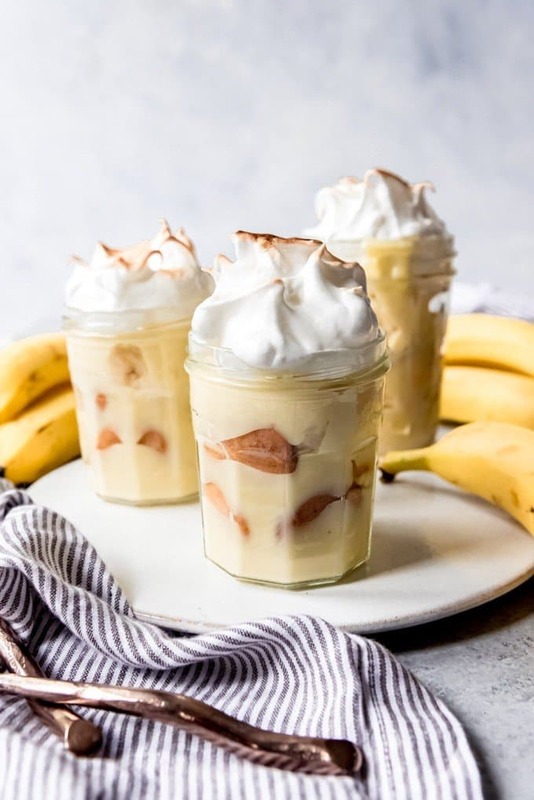 But lots of people like to make the homemade banana pudding ahead, chill it in the fridge and serve it cold, adding the meringue and toasting it right before serving. This Homemade Banana Pudding recipe is a classic Southern dessert made with layers of sliced fresh bananas, an easy homemade custard, Nilla wafers, and topped with a light and fluffy meringue! 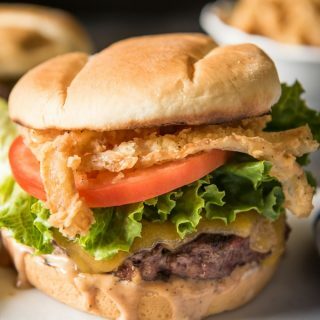 It's the perfect way to finish any Southern meal! In a medium-size mixing bowl, whisk together the flour, sugar and salt. Add the egg yolks (save the whites for a meringue) and 1/2 cup of the milk, whisking again until smooth and combined. Pour the remaining milk into a heavy saucepan and warm over medium heat, just until bubbles begin to form around the edges of the pan. 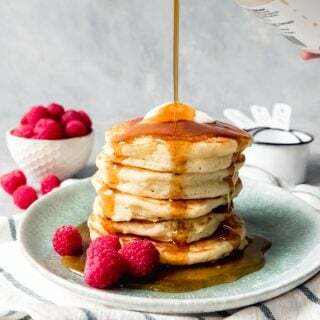 When the milk is hot, slowly pour 1 cup of it into the egg yolk mixture, whisking until combined to temper the egg yolks. Then transfer the tempered yolks to the pan with the remaining hot milk, whisking constantly to combine. Continue to cook and stirring constantly over medium heat for about 10-12 minutes until the pudding has thickened. You may prefer to use a double boiler to prevent scorching, but I've never had a problem as long as I keep my heat at medium and stir constantly. Once the pudding is thick, remove from the heat and stir in the butter and vanilla. Layer Nilla wafers in the bottom of individual serving dishes or a large bowl, trifle dish, pie plate, or baking dish. Add half of the sliced bananas. Spoon half of the pudding over the bananas, then repeat the layers with the remaining Nilla wafers, bananas, and pudding. 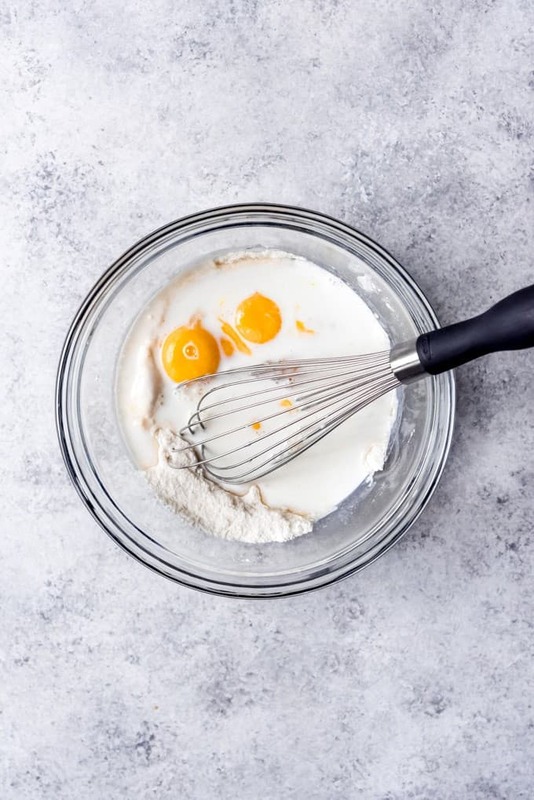 Beat the reserved egg whites and cream of tarter in the bowl of a stand mixer fitted with a whisk attachment until soft peaks begin to form. Add the granulated sugar while beating and continue to beat until stiff peaks form, about 3-5 minutes. Spread the meringue on top of the banana pudding, using the back of a spatula to create peaks and swirls in the meringue. 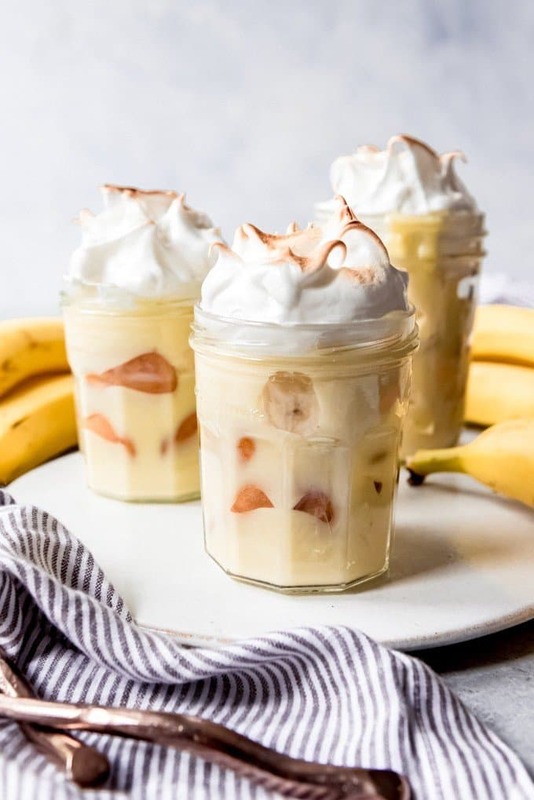 There are a couple of ways to finish the meringue depending on what container or presentation you are using for your banana pudding. If I'm making a big bowl or casserole dish of pudding, I will bake it for 10-12 minutes at 350 degrees F until lightly browned on top. For individual servings in mason jars or ramekins, I will broil them until the top of the meringue is toasted. Garnish with Nilla wafers, if desired. This recipe fits a 7 x 11-inch baking dish, but isn't enough for a 9 x 13-inch baking dish. You might want to make a double batch and use the larger 9 x 13-inch dish if feeding a crowd.